One of our agents has come into the possession of a lockbox attuned to the element of Earth. Contained within it are rare and powerful treasures that embody the elemental power of Earth. Remember that each lockbox requires its own Enchanted Key before you can reveal what's inside. You can find Enchanted Keys in the Zen Market by pressing 'Y'. 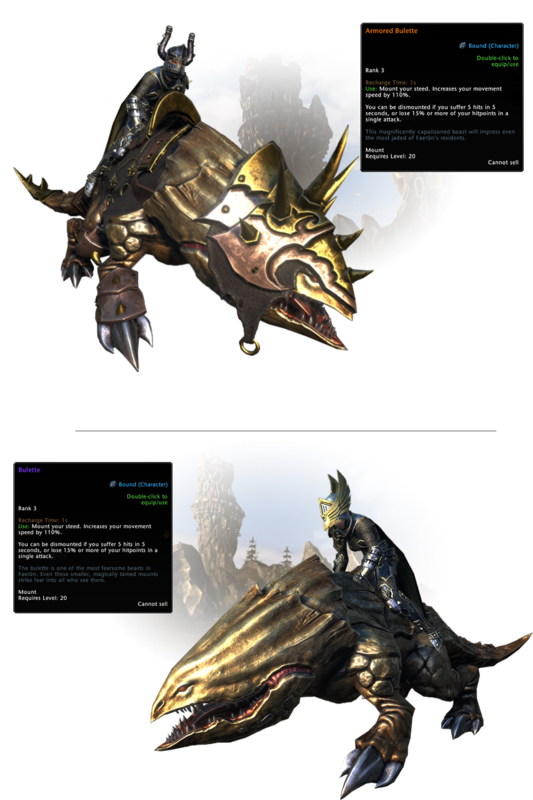 Armored Bulette and Bulette Mounts – Often referred to as “landsharks”, Bulettes are some of the most feared beasts in all of Faerûn. The only thing more intimidating than a charging landshark is the rider leading the charge. Symbol of Earth – Crush your enemies with the power of the earth. 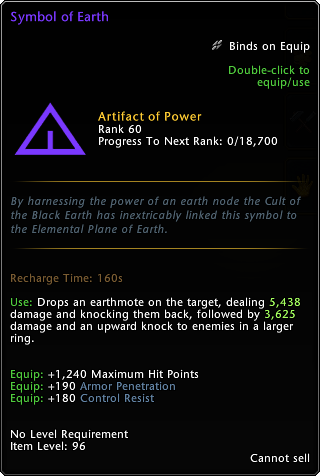 This magically enchanted symbol will summon an earthmote to crush your foes into oblivion. Ensorcelled Arsenal – The leveless equipment contained within this pack will match the strength of the wielder as they level, increasing in power up to level 70. Trove of Elemental Evil – Fill with items stolen from all the elemental cults, this trove contains a myriad of relics both powerful and rare. - 1 Rare Profession item. - 1 Epic, Rare or Uncommon Profession item. - 1 Epic, Rare, or Uncommon Black Ice Shaping Asset. - 1 Uncommon Black Ice Shaping Asset. - 1 Uncommon Black Ice Shaping Resource or 250 Black Ice. Companion Fortification Kit – Items from the companion kit can be used to strengthen your companion’s effectiveness in battle. Notably, you will have a chance to gain a companion upgrade token which can help you upgrade your companion to Max level 40. Tarmalune Trade Bar Jackpot – Get yourself a greater chance to obtain Tarmalune Trade Bars in large numbers! Tantalized by these artifacts from another realm? Login now and claim them before they are claimed by the earth forever!